The CPD Certification Service defines Continuing Professional Development (CPD) as ‘the term used to describe the learning activities professionals engage in to develop and enhance their abilities. It enables learning to become conscious and proactive, rather than passive and reactive.’ We would add that this is essential for the accomplishment of all your professional responsibilities. The focus of CPD is firmly on outcomes – the benefits that you, as a professional, can bring to the real world. The emphasis here is the word ‘you’. Everyone is different and learns in different ways. Therefore, it is up to you to identify not just what to develop but also how you will go about this. Why is CPD important to the IAPC&M? Our mission is to increase public confidence and raise industry standards by enforcing a vigorous and comprehensive accreditation process that ensures the quality of professional coaches and mentors. CPD forms an integral part of our accreditation process (application and re-accreditation) to ensure that our accredited practitioners demonstrate they have the highest levels of professional standards (and capability) in the industry. ‘Through accreditation, we build trust in the coaching and mentoring profession for the benefit of everyone’. How do I identify my CPD requirements? The first step is to consider your own learning and development requirements. You can begin by recognising and accepting gaps in your skills, knowledge or experience. Then you can consider what improvements you can make to improve your professional and/or business practices. Plan – Plan what you are going to do, how and by when. Also consider how you will evaluate the activities. Do – Do what you have planned to do. 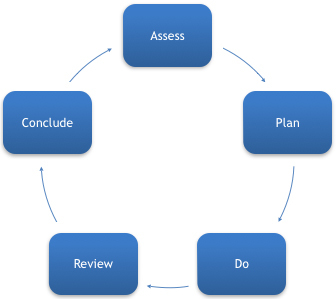 Review – Review/evaluate what you have done and consider how you will use this in practice. What are the IAPC&M requirements for CPD? The IAPC&M Code of Professional Conduct states that ‘…a provider must demonstrate a commitment to continued professional development (CPD).’ The requirement is a minimum of 30 hours per rolling year. It is your responsibility to keep an accurate and up-to-date record of your CPD activities. This will always depend upon you, what you want to learn/develop and your preferred learning style. 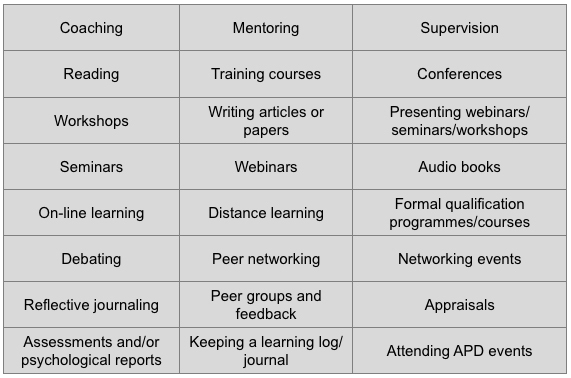 In all cases consider what will have the greatest impact on your current and future professional practice. Choose wisely; not too much and not too little. Be realistic about what you can achieve. The list can be endless, so it is important to bear in mind two things. Firstly, it’s about you and how you will use your learning for the benefit of you and your clients. Secondly, a range of activities will enhance your range of learning options. We provide a template which can be downloaded from the accredited area, however you may keep whatever records work best for you, providing they are detailed and explanatory. Your CPD report/record must be signed and dated upon submission. This is to ensure that the information you provide is accurate, authentic, valid, and reliable and is submitted by you honestly. If false or misleading information is found to have been submitted by you, the matter will be referred to the Professional Standards department. If, after an investigation, the case is proven, your accreditation status (or application) may be suspended or terminated (or denied if applying). Equally, if you do not comply with the requirements of the IAPC&M’s requirements for CPD, your case will be referred to the Professional Standards department for review. This failure to comply may result in the same outcomes as outlined above. What if I can’t complete any CPD? We recognise and acknowledge that life sometimes throws a curve-ball. This can include illness, redundancy, personal issues, maternity/paternity, bereavement, sabbaticals, ‘time-out’ and relocation to name a few. If you have a planned or unintentional break from your practice and/or CPD activity, let us know by contacting the accreditation department.